The structural and vibrational properties of metals and alloys at high pressure is a priority area in modern materials science research. 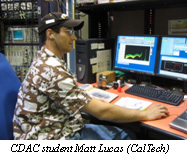 CDAC-supported graduate student Matthew Lucas (Caltech), and fellow Caltech student Alexander Papandrew, along with their advisor, Caltech professor and CDAC partner Brent Fultz, and HPCAT scientist Michael Hu report measurements of nuclear resonant inelastic x-ray scattering spectra for 57Fe in disordered body-centered-cubic alloys of Fe-Cr. Partial phonon density of states (DOS) curves were obtained from these data. These results, in conjunction with the results of Ruckert et al. [Hyperfine Interact., 126, 363 (2000)] on Fe-Cr thin-film multilayers and alloys, were analyzed with a local-order cluster expansion method. 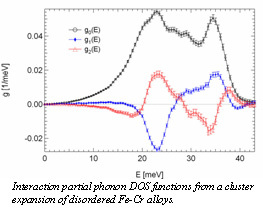 Interaction partial phonon DOS functions for the different short-range correlation functions were obtained from the disordered alloys. These interaction DOS functions were used in reconstructing the 57Fe partial DOS curves measured by Ruckert et al. on a set of thin-film multilayer samples of 57Fe/56Fe/ Cr. The method works well with terms up to a combined first- and second-nearest-neighbor triangle cluster, which were obtained reliably from the disordered alloys. The limitations of a basis set of correlation functions from disordered alloys appear to be acceptable for the chemical trends of phonons in the Fe-Cr system [Lucas et al., Phys. Rev. B, 75, 054307 (2007)]. In a series of challenging Brillouin scattering experiments, the single-crystal elastic constants for zoisite Ca2Al3Si3O12 (OH) were determined by Princeton CDAC-supported graduate students Zhu Mao and Fuming Jiang and CDAC academic partner, Princeton professor Tom Duffy. The elastic tensor was obtained by an inversion of acoustic velocity data for three different crystal planes. The aggregate bulk modulus, shear modulus, and Poisson's ratio are KS0 = 125.3(4) GPa, G0 = 72.9(2) GPa, and σ 0 = 0.26(1) for the VRH (Voigt-Reuss-Hill) average, respectively. The maximum azimuthal anisotropy of zoisite is 22% for compressional velocity and 33% for shear velocity, and the maximum shear splitting is 21% along the  direction. 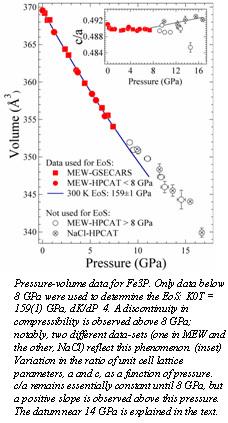 These results resolve the discrepancies in bulk modulus and axial compressibilities reported from static compression studies, and provide the first experimental constraints on the shear modulus [Mao et al., Am. Mineral., 92, 570-576 (2007)]. Laser heating of samples in the diamond anvil cell continues to be a crucial tool in the exploration of crystal structures at high temperatures and pressures. 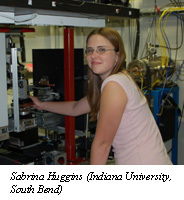 Henry Scott (Indiana University  South Bend), his student Sabrina Huggins, and scientists from Northern Illinois University, SUNY, HPCAT, MIT, and UC-Santa Cruz have collected in situ x-ray diffraction patterns of end-member Fe3P-schreibersite in a diamond anvil cell to pressures of 30 GPa at 300 K. Some samples of Fe3P were also laser heated at high pressure to temperatures of ~2000 K and examined following thermal quench. Below 8 GPa, variation of the schreibersite unit cell volume delineates a smooth P-V curve corresponding to a second order Birch-Murnaghan equation of state with bulk modulus, K0T, of 159(1) GPa. Above 8 GPa, however, the schreibersite structure shows substantial stiffening, and an unidentified structure develops between 17 and 30 GPa; upon decompression to ambient pressure the schreibersite structure returns. Therefore, although ubiquitous in iron rich meteorites, it is unlikely that schreibersite is the stable phosphorus-bearing phase in deep planetary cores. The research appears in the March 21st issue of Geophysical Review Letters [Scott et al., Geophys. Res. Lett., 34, L06302 (2007)].